Torquay Funeral Directors Hugh Mills & Gaye was formed in 1805 by Hugh Mills, who was renowned for constructing many of Torbay’s landmark churches and buildings, alongside his funeral directing business. 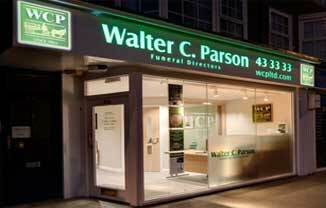 In 2006, following careful consideration, the reins of the business were handed to Walter C. Parson, a family owned company with branches across South Devon, allowing Norman Williams to retire after 50 years at the helm. A short distance from the main shopping area, and fronting the main road, Hugh Mills & Gaye is very easy to locate and there is plenty of parking available at the rear of the premises. Our Torquay office serves Torquay, Paignton, Brixham and the surrounding areas. Feedback. "Your care, attention to detail and professionalism really was second to none"
Feedback. "Your professionalism and support excelled my expectations." Feedback. "Me and my family were at ease and really appreciate your care"